So I have downloaded and installed Pro Tools 10.3.3 as well as the latest version of the Gobbler app and I have the Send to Gobbler feature. 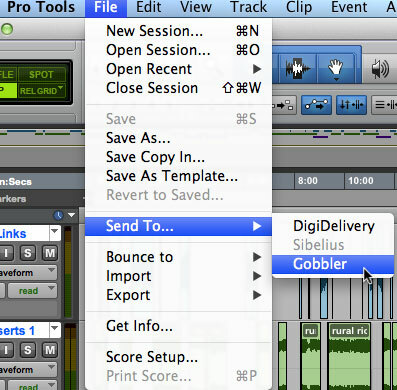 So what happens when you select the new Send To Gobbler option from the File menu in Pro Tools? 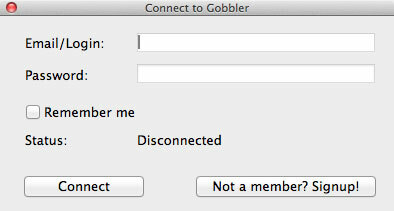 Well you are asked to log into Gobbler with your user name and password assuming you already have an account…. 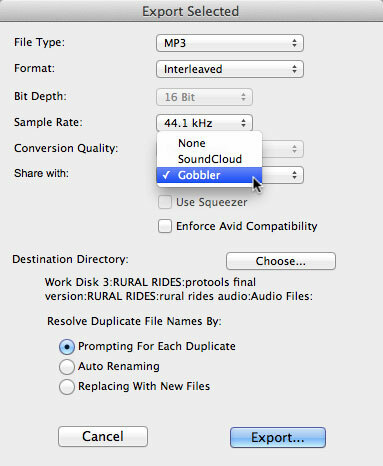 Then the Gobbler application opens and you get the Send Files window in Gobbler and the current session will be already in the window, in this case “rural rides audio”, which is a documentary I put together ready for transmission on BBC Radio 4 in the new year. So there it is, and if you check “Make available for public download”, your recipients won’t need to enter a password to download. They will get an email with a big “Download” button. Simple! Don’t forget when you use the Send To Gobbler feature with the Mac version Gobbler will handle all the files in the session even if they aren’t in the main Session folder, so no more worrying about there all the files are. My only request is can we have an option simply to back up the current project from the Send To Gobbler option without having to send the session to anyone. Simply be able to archive the current session to the cloud with a couple of clicks from within Pro Tools? We apologise for the confusion earlier. The option to back up to Gobbler is actually on the Gobbler roadmap, and does not require Avid’s involvement at all. So no need to request the feature from Avid.